Born in 1860 in the small town of Ivancice, Alphonse Mucha became famous in 1895 in Paris, with Gismonda, his first poster for Sarah Bernhardt (1844-1923), the greatest actress of the time. 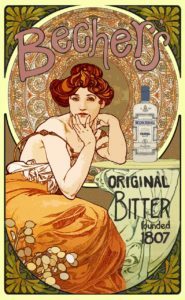 As a poster artist, Mucha developed a very personal style, the “Mucha style“, characterised by sinuous forms mixing young women, floral motifs and ornamental lines, as well as a subtle range of pastel shades. This style would soon embody the movement emerging at the time in the decorative arts – Art Nouveau. While he is famous for his posters, Mucha was a versatile artist: painter, sculptor, photographer, decorator and also a valued teacher. During his first trip to the United States in 1904, he was called “the greatest decorative artist in the world“. But his political and humanist beliefs led him to gradually give up this decorative style and to undertake cycles of history painting, sometimes in very large format, in a militant and idealistic spirit.